The evil Ice Queen, threatened by Snow White’s beauty (“lips redder than a salmonberry”) sends an assassin musher, then disguises herself as a trapper to deliver a constricting fur coat. Finally, she gets to Snow White as a friendly homesteader offering a peppermint drink that freezes our heroine. Thank goodness the Great Race means a handsome young musher finds Snow White—and warms her with love and a cozy fire. They mush happily ever after when the Ice Queen’s rage makes her skate right through the ice to her demise. Children and adults alike will enjoy this Alaskan take on the classic Snow White fairy tale. 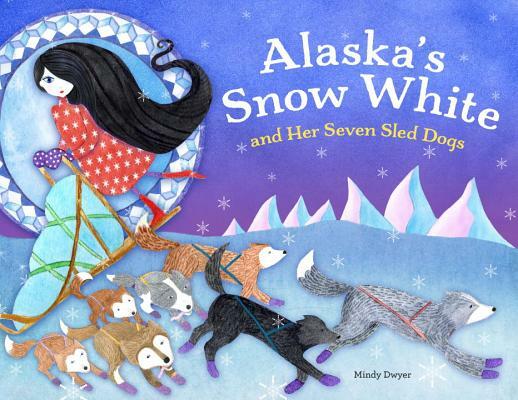 Mindy Dwyer is the award-winning author and illustrator of several children’s books such as The Salmon Princess and Alaska’s Sleeping Beauty. She lives in Port Townsend, WA.